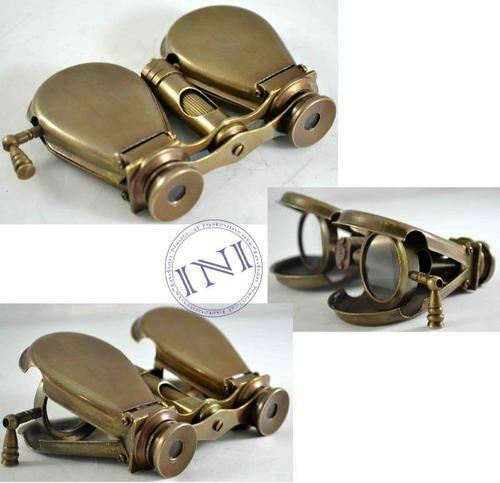 We are one of the affluent manufacturer and exporter of Brass Binoculars product. It comprises of Steiner Binoculars, Alpen Binoculars, Astronomical Binoculars, Nikon Binoculars, Powered Binoculars, Bushnell Binoculars, Binoculars. These binocular products are manufactured and designed in accordance with the latest market trends. These are accessed at cost effective price and checked by special checkers. We are the leading manufacturer and exporter of all kinds of Pocket Binoculars which are highly appreciated by the clients for its desired outcome. Therefore, these binoculars are very coveted in the market as well. Furthermore, we are availing them within affordable price range and assure timely delivery to our customers. These binoculars are coated with excellent polish in order to secure them from the effects of harmful chemicals. Being a manufacturer and exporter among the leading companies across the world, we provide Antique Gift Binoculars with excellent quality that are sourced from most trusted vendors of market with the aid of our procuring agents. These products are beautifully polished and are available in different sizes as per clients' requirements at incomparable prices. Apart from this, these binoculars could last long and give splendid performance for years. Our company is instrumental in manufacturing and exporting a qualitative of bushnell Brass Binoculars using the best grade raw material with latest technology, the offered range is designed with high precision in order to meet the set industry standards. To meet the variegated expectations of clients, we offer these busnnell binocular in different sizes, designs and patterns. Moreover, these have splendid functionality and are manufactured at par with the industry standards. Our company is well known in the market for the manufacture and export of Opera Glasses Binoculars. Its special like antique looks, long service life, light weight, maintenance free operation are widely appreciated by our customers. Our range of binoculars can also be customized as per the specification of our customers. Finally, these binoclulars are available at cost effective prices to our beloved clients. We have gained immense expertise in manufacturing and exporting of Vintage Antique Binoculars to the customers. High grade and best quality, thoroughly tested by our experienced workers makes it a must buy for our clients . Further, clients can avail these metal snap buttons in various sizes, dimensions and designs at reasonable prices.